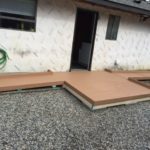 Here is one of our custom access ramps. It is painted and texturized to allow client to rinse outside. This installation is only temporary and will be uninstalled when the client no longer requires it.